Pakumuse has finally got a home she can call her own. Please continue to visit me HERE! I'm a little troubled today. So far, only myself and my parents are going. But VT did hint that he wants to go. Ok so if he goes, my MIL will have to take care of both the Bs full-time (day & night) for 7 to 8 days. I think it's too much for her. Solution: we'll take Bryan along. If we take a hyper 2 1/2 year old along, can he tolerate all the "naik bas, turun bas" involved in taking a tour? What happens when it's time to leave a place and he refuses, and starts screaming? What happens if he poops in his pants on the bus, on a long journey up Mount Fuji? What if he goes beserk in the plane, being his first time on it? I tried asking for a private tour but the tour operator told me that it is expensive and not worth it. We had another hectic weekend. 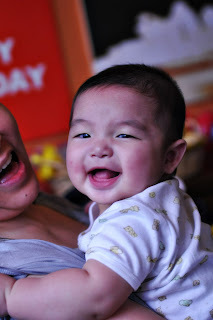 We celebrated my 2nd brother's second son's first birthday (lots of 1s and 2s there, yes?!) with a lunch hosted by my brother at Paya Serai coffeehouse at PJ Hilton. For the first time, I managed to see myself the train set which the hotel has been putting up year-after-year. It was simply breathtaking! I shall post photos of them up here once I get them from my brother. I was told that the train setting gets bigger and bigger each year as they get more sponsors. Anyway, back to the lunch. We were there from noon and didn't leave until past 4pm! Not like I was eating away but the birthday boy had fallen asleep before the cake was cut. So everyone was sitting around waiting for him to wake up. Of course, I didn't have the luxury of sitting down. Bryan made me make numerous (after 10 times, I'd stopped counting) to the train set and the Xmas tree by the lobby. As expected, Bryan knocked-off the moment we strapped him into his carseat and continued napping at home until 6pm. Which was a good thing, because I had my best friend and her daughter (also my god-daughter) over for dinner. She ta-paued chilly crabs, steamed salted chicken (very very good!!) and sweet & sour pork. I stir-fried mix veg with beef strips, marinated with ginger extract & chinese wine, to complete the meal. The kids had such a great time exchanging belated Xmas presents, that both Anya and Bryan put on their new clothes immediately - and on top of what they were wearing! We hosted a small "fast food" luncheon for a few of our uni friends, whom we've not caught up for some time. Yes, VT and I have common friends because we studied in the same uni although we weren't dating then. We also set up our mini wading pool on our car porch for the younger ones to splash around after lunch. It was great catching up though I had to take leave twice to put Brandon down for his naps. At night, just as we thought we could wind down, the doorbell rang and lo-and-behold, my confinement lady (with Brandon, the better one not the one whom I sacked) was at the door. She was in the neighbourhood so popped by to see Brandon. We chatted for a good hour or so before she left. It was close to 8pm by then so I quickly gave Bryan his bath and VT & I sat down for a dinner of claypot chicken rice with chicken soup. I was totally washed out by the time I was in bed. It didn't help that Bryan refused to lie still and neither did he stop talking to himself. Two hours must had passed and that boy was still awake despite yawning a few times. I finally threatened to walk out of the room if he didn't lie down, keep still and close his eyes. Which he did, and promptly fell asleep less than a minute after. Shows you how tired he was but was reluctant to sleep. Well, that was my weekend. What were you up to? One of my motivation for gymming today is that I wallopped a Big Mac at Izac's 3rd birthday party yesterday *guilty*. 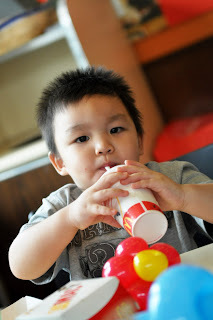 Izac's mummy celebrated his birthday at McDonalds Mutiara Damansara. We were one of the first ones there as Bryan was getting restless at home and Brandon also woke up earlier than usual from his morning nap. Bryan had a great time playing the slide and eating all the french fries and drinking cold Ribena, which he almost never gets to drink at home. So he was really "out of the prison" yesterday. As a result, he did his "big biz" again at Mackers. Some more I thought it was quite safe yesterday as he had already done it in the morning. Luckily VT was around to do the cleaning up. As brothers have it, Brandon also followed suit after Bryan. Sounds like that day! I think VT very frus ha ha. But thanks again, Sue for having us! When we got home, Bryan & myself napped for an hour while Brandon napped for 2 1/2hours. We had a quiet dinner in consisting of teochew porridge and all the unhealthy (but yummy!) condiments, such as salted duck egg, preserved beancurd, preserved lettuce and the must-have peanuts and anchovies. Oh, as a side note, Brandon finally flipped himself yesterday (once) and this morning (once). But he will cry "Wah wah wah" because his left arm would still get stuck between the mattress and his fat body keke. 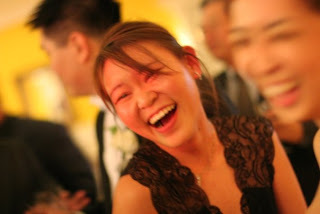 Thanks to this keng chau mummy for the photos! As I count down towards the last few hours of 2008, I asked myself what is there to remember about this year. If there was one month that will forever be etched in my memory, it would be the month of July. On the 5th, Bryan was admitted into DSH for this terrible, terrible accident. His scars serve as a daily reminder for me to be a better and more vigilant mother. It also reminds me (more like kick myself in the b*tt) to be grateful for the lovely children that I have. Yes, even when they cry for hours with no apparent reason or when they drive me up the wall with their antics. And yes, even when the older one still wakes up countless times at night. I shall be grateful, for it can be taken away from you with a snap of the finger. And then on the 19th, I was back at the same hospital. This time was for a joyous ocassion. I told myself not to cry like I did with Bryan when the baby was delivered, but it was just overwhelming when the ob-gyn placed lil' Brandon on my chest with his umbilical cord still uncut. I stared hard at his face, trying to remember every single detail and the flood gates opened. Two incidences this year within a span of two weeks from each other - one sad, one happy. But both relates to my being a mother. So, if you were to ask me whether 2008 had been a good year, I would reply, "Most definitely! Any year is a good year when you have beautiful and healthy children!". With that, I bid 2008 goodbye and say hello to 2009. Bring it on! We just had a long weekend over Saturday to Monday (being the Islamic new year). So what were we up to? Do you recognise these beautiful girls? Yes - that's me with Baby C and Sherilyn - the cutiepies belonging to HealthFreakMommy. Alycia is like the mummy, very photo-shy! I'd finally met up with the pretty, young-looking mother of 3. Shireen is also my SIL's pal from schooling days as the both of them are from Ipoh. Very small world! We met up at the Jungle Gym located on the top-most floor of Bangsar Shopping Centre. The concept is liks KidzSport I've been told. Per entry cost is RM28 per child, which was quite hefty to my mind. The good thing was that Bryan had his nap on the way to BSC so his energy level was tanked up to play. Lunch was at the cafe just outside the gym - food is great although we had to be seated outside which was kinda warm. I like the gym because security is rather tight. The guardian's thumbprint is taken when we "check" the child in, and only the same person can "check" the child out by scanning the thumb again. And then there is a TV screen just outside which has CCTV covering the gym so that parents can watch over them. For good measure, I took turns with my maid to watch over Bryan while my Mum watched over Brandon. Poor VT was working on Saturday so he couldn't join us. We arrived home past 5pm and I hurriedly whipped up a quick meal of steamed fish and taufu with minced chicken for our dinner. Thank goodness VT was home by 6pm to take over Brandon. Sundays are our usual mall-visiting days. Right after his bath, Bryan will proclaim "Sup(er)market" very loudly. We arrived at 1U and to our dismay, could not find a parking spot. So after searching for 20mins and paying RM1 to exit, we headed towards Hartamas Shopping Centre inside. In the process of car park hunting, Bryan fell asleep and I had to feed Brandon. There was a new TGIF which opened there so we decided to check it out. Again to our disappointment, this outlet doesn't have a "Kids Eat for Free" promo. When I asked the manager, he said that it was different for every outlet but I was never theless shocked because I thought it was one of their selling point. Then the Chicken Fingers that VT had was so small that we enquired whether they wrongly delivered the kiddies portion instead (which they say the did not)! VT and I have decided to boycott this TGIF outlet from there on. After lunch, we headed to "Toys-R-Us Express" - it is just a smaller version of the normal & larger Toys-R-Us stores. Just as we went in, Bryan squatted down at the main aisle, in full view of other shoppers to perform his "big biz"! VT whisked him away to clean him up. Then 2 minutes later, I saw Brandon straining and making grunting sounds. So I wheeled him and passed him to VT to change, just as Bryan was wearing his shorts. Must had been the "umm umm" sounds that I was making when Bryan was doing his! A few of us gathered at this mummy's house for a small makan-makan gathering. I met Michele for the first time. This wonderful mummy learnt balloon-sculpting from YouTube and made a dog for Bryan! Isn't she amazing? Then this mummy brought her giant swimming pool and all the kids had a whale of a time. I had to leave early as both the Bs were getting grumpy. I would have loved to stay and chit-chat with all the mummies. We cannot seemed to stop talking!! For dinner, I made Seafood Tom Yum meehoon and had my PILs over. It was so easy, thanks to the ready-made paste. I think I shall make this more often. After putting Bryan to sleep, I had wanted to potter around the house a bit and spend some alone time with VT. But mana tau, I must had fallen asleep as when I woke up, it was 3:40am! Bryan has been copying everything that Brandon does. For instance, drinking milk 8 times a day at the same intervals, making coo-ing sounds, sometimes wanting to be carried when drinking milk, holding his chin to burp him (!) and sitting on the Fisher-Price rocker. So it was not surprising that when I brought home the Bumbo seat, on loan from Bridget, Bryan wanted to have a go at it after didi. Funny thing is that Bryan hated to sit in the Bumbo seat when he was a baby! Here's one of Bryan below as a baby. Looking at it, the two brothers look alike! If I start straying from this resolution, please knock me on my head. Better still, show me the first photo! I have lots of Isomil SOYA formula to give away - free of charge! Bryan is no longer cow's milk protein allergy (hooray!) so I've switched him over to normal cow's milk. I could continue with the soya formula, no doubt, but I'd thought I can "strengthen" his tummy by moving him to "normal" milk. As a result, I have un-opened packets of his old formula. If you know anyone drinking this brand, do let me know or ask him/her to contact me. So with those decisions in hand, now I need to look for a reliable tour company. I didn't think going on a Free-and-Easy tour would be a good idea although it would be cheaper. Afterall, I have two elderly parents to look after plus a hyper-active toddler. So, if you have any recommendations, I would be grateful for some advice. P/S: If you're wondering whether I had a huge bonus pay-out, or if I striked lottery, it's negative to both. I think I'd just realised that there are somethings in life that I needed to do sooner rather than later, before it's too late and I end up regreting. Life was a breeze before the stork arrived with two bundles of joy. It is undoubtedly more demanding now but I'm enjoying every bit of it! 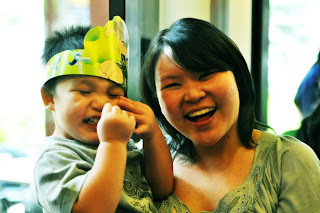 I am a full-time working mother to a hyper-active toddler and a beautiful baby boy.